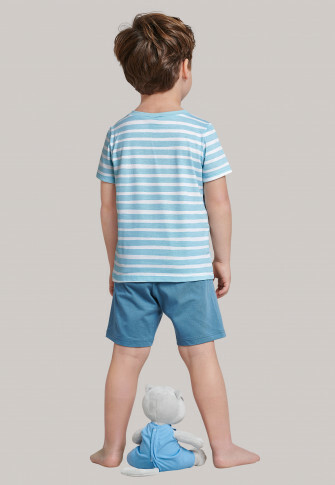 These short pajamas for boys are the perfect companion for exciting dream adventures! With this striped shirt featuring a cool print, the motto is clearly "Chill"! The "Chill Hand" sets a real statement here and becomes a visual highlight. The short, denim blue pants made of 100% soft cotton guarantee pure relaxation in the best SCHIESSER quality. And because fun together is simply even more fun, there are mini-pajamas for your Henry stuffie as well!